A proven first pick in kitchens, America’s #1 sausage brand, wanting to get out of the kitchen, called a blitz to open up the C-Store channel and stoke demand. For the brand to win a road game, it would need a clever strategy that truly understood the morning breakfast sandwich buyer, making itself indispensable to C-Stores. Grabbing breakfast on-the-go is better than skipping the meal altogether. But something hot and fresh might mean a trip to the fast food drive-thru. In a time-crunched world, for morning commuters who already stop at convenience stores or gas stations, a clock-draining trip to a QSR just isn’t a good call. Research showed that male commuters are fanatics for breakfast sandwiches. So we developed a game plan to go for two: (1) drive awareness, and (2) grow availability at convenience stores and gas stations. Strategy dialed in on the audience’s preference for morning sports radio. 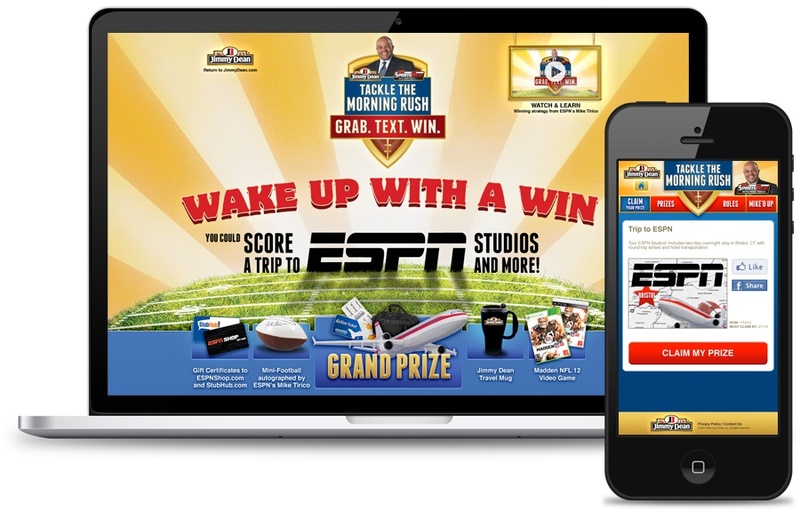 We drafted America's #1 play-by-play caller, Mike Tirico, connecting with the target in a winning-is-the-only-option trade and consumer program. Mike convinced stores to stock Jimmy Dean through sales contests, trade video and sell sheets. He also coached our audience into grabbing sandwiches and texting codes from Jimmy Dean Sandwich warmers. 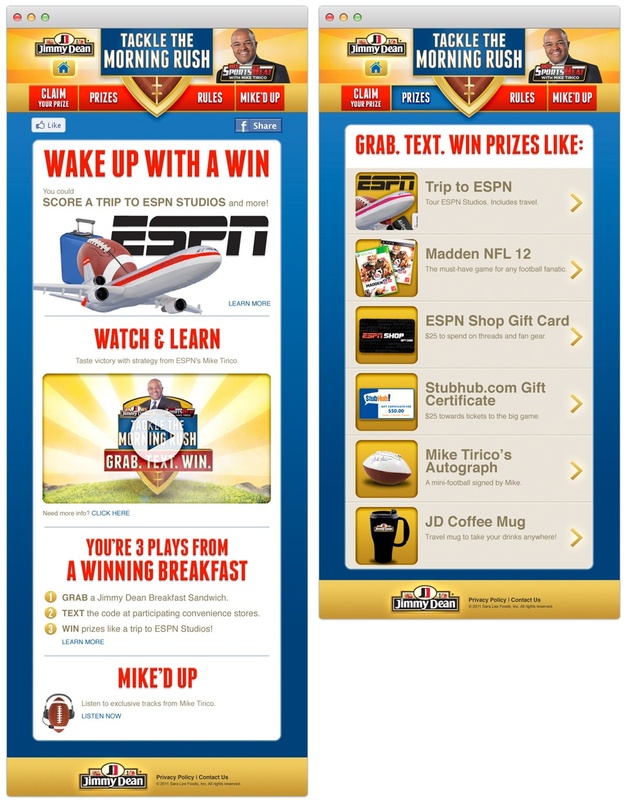 Each entry offered a chance to win a free trip to ESPN Studios, Madden12 video games, autographed swag and exclusive content from the promotion's mobile optimized site. Store signage directed gas station and convenience store shoppers to sandwich warmers. 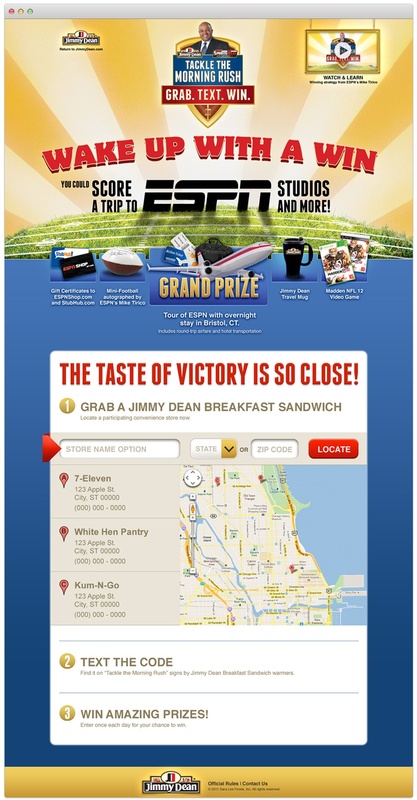 Jimmy Dean takeovers on ESPN.com helped others geolocate participating stores through run-of-site ads. In the end, we defeated hunger and morning commuters earned big prizes—as well as more time in their day.